Dreaming of Mother England? We’ve got just the thing to satisfy your longings for Ol’ Blighty…. Tip your hat and bid a cheery ’ello to Cornishware. Cornishware has been around since the Twenties, when it was produced in Derbyshire. 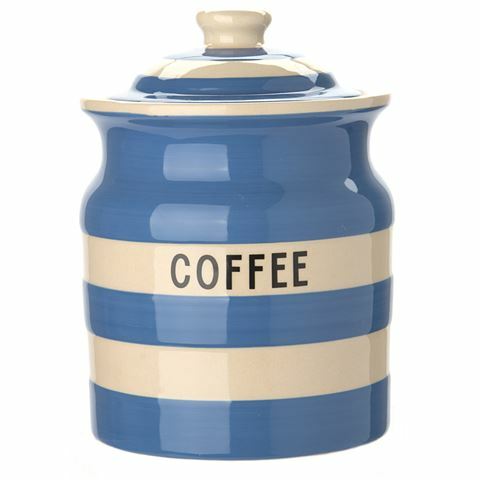 When a factory employee saw Cornishware’s distinctive striped design, he commented that the blue and white stripes reminded him of the blue sky and white-crested waves of his native Cornwall. The name stuck, and Cornishware has become an English icon. Keep the tradition alive, with the new Cornishware collection. These classic pieces are a nod to England’s proud history of fine pottery; they’re beautiful as well as functional. Though the design might be nearly one hundred years old, these days, Cornishware is thoroughly modern. When your favourite piece of Cornishware is in need of a wash, just throw it in the dishwasher! It can cope with anything your busy kitchen can throw at it. Put away your passport. Stop packing those suitcases. There’s no need to head overseas. Cornishware pottery is like a little bit of England, right here in Australia. Silicone rim around the lid provides an airtight seal. Beautifully presented in a Cornishware gift box.